1 of 3 Heat oven to 350 degrees F. Coat eight one-cup ramekins with nonstick cooking spray. Lightly beat eggs in a large bowl. Add milk, parsley, salt and pepper. 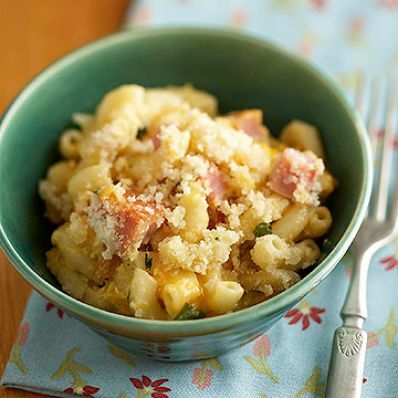 2 of 3 Stir in macaroni, cheese and diced ham, if using, and toss to combine. Divide evenly among prepared ramekins. Sprinkle top with an even layer of bread crumbs. Sprinkle with Parmesan. Dot with butter. 3 of 3 Bake at 350 degrees F for 20 to 30 minutes. Let cool 10 minutes before serving.